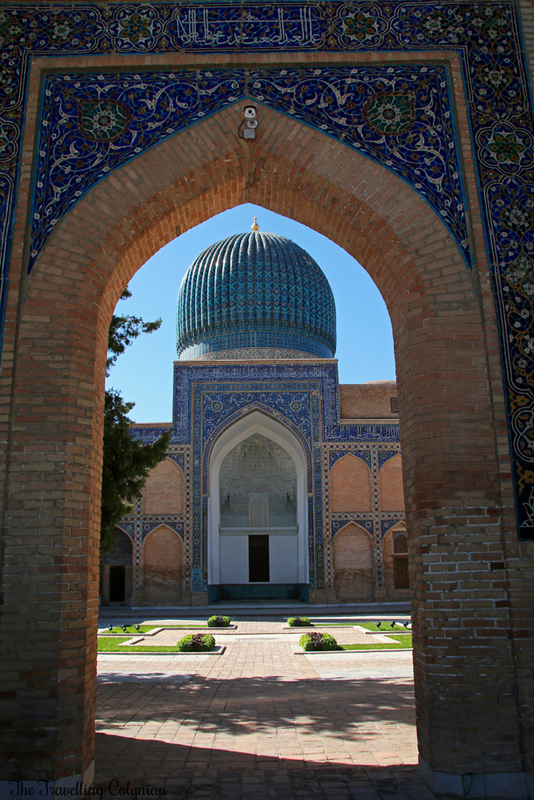 When dreaming of Samarkand most people automatically think of the Registan, in particular those who haven’t been there. The landmark of the city with its three medressas and minarets, the elaborate decorations and their beautiful courtyards is truly majestic. 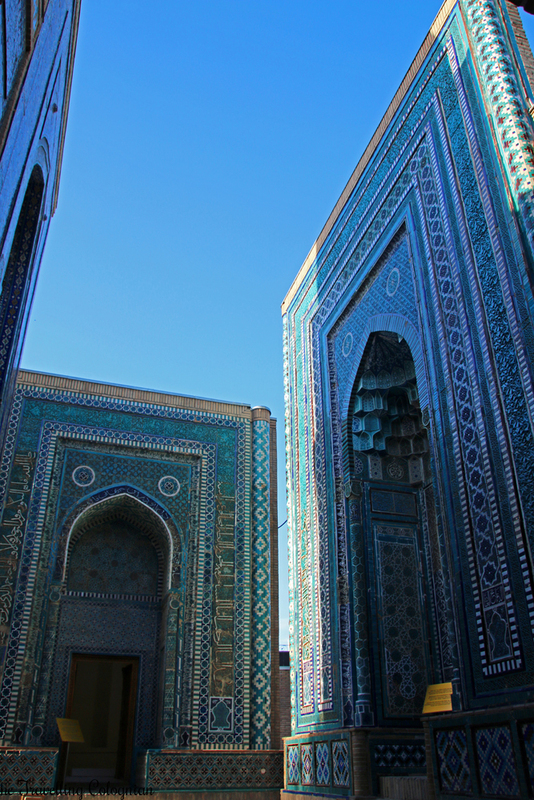 But Samarkand has a lot more to offer. 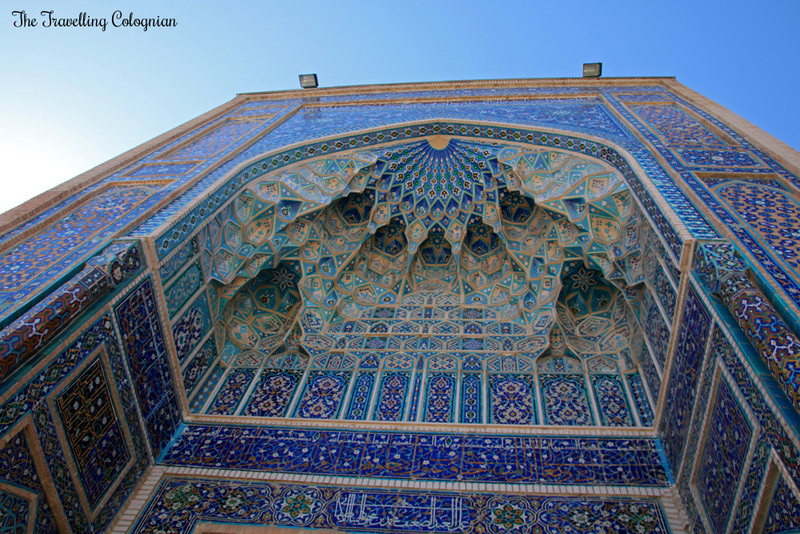 The Gur-E-Amir Mausoleum with its azure dome, the two minarets and its beautifully designed golden interior space. 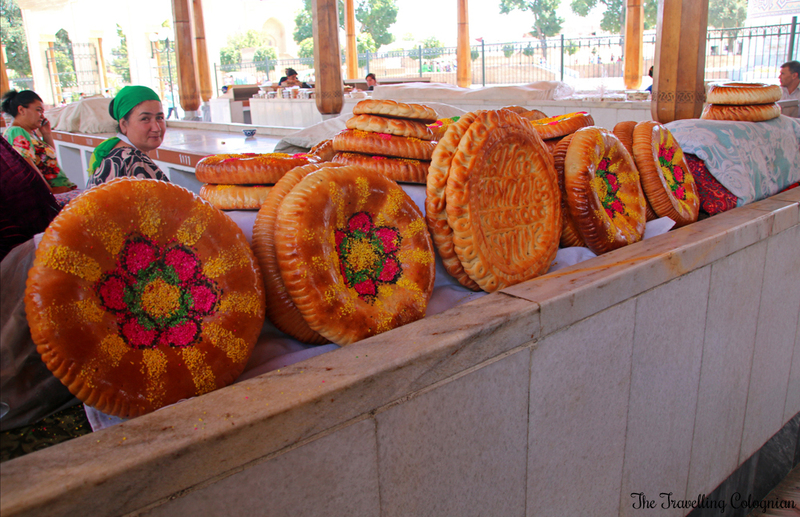 The lively Uzbek Siyob Bazaar where you can buy fresh fruits and vegetables, dried fruits, nuts, spices and the typical Uzbek nan bread. 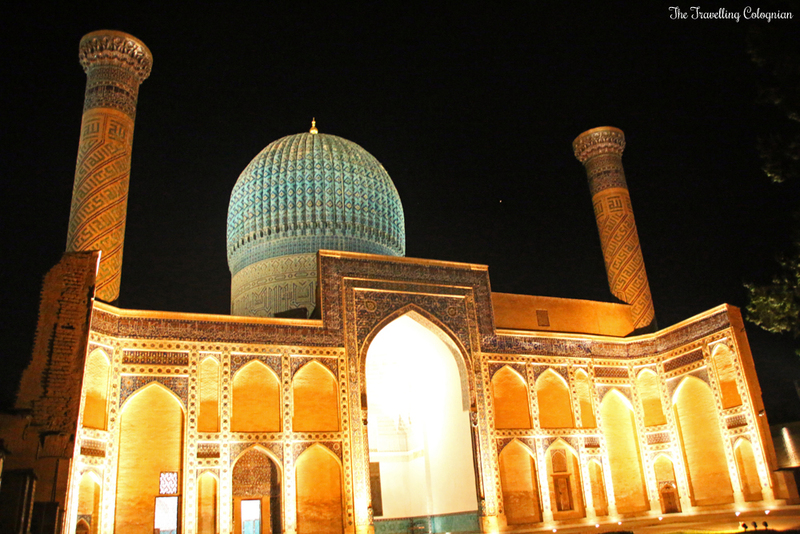 The Bibi Khanym Mosque which was once the most splendid mosque of the Islamic world. 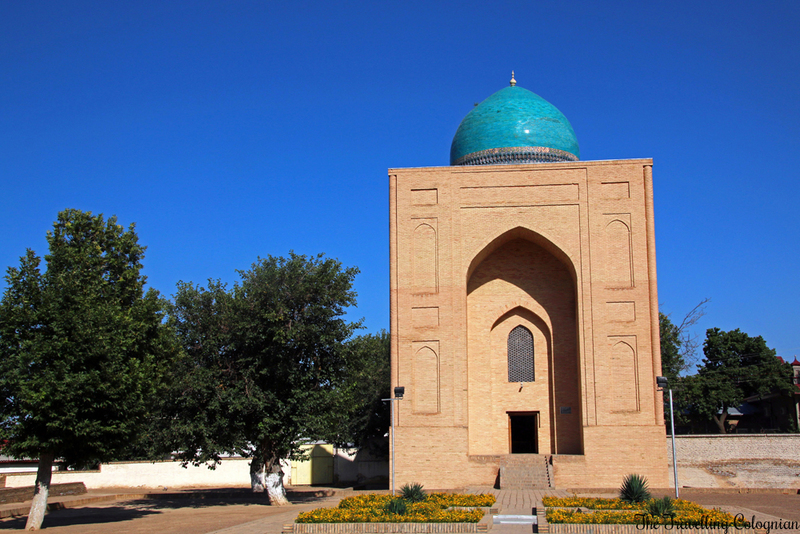 The Bibi Khanym Mausoleum where Bibi Khanym and four of her relatives are said to buried. The magnificent Avenue of Mausoleums, Shah-i-Zinda, with its many domes and mausoleums. 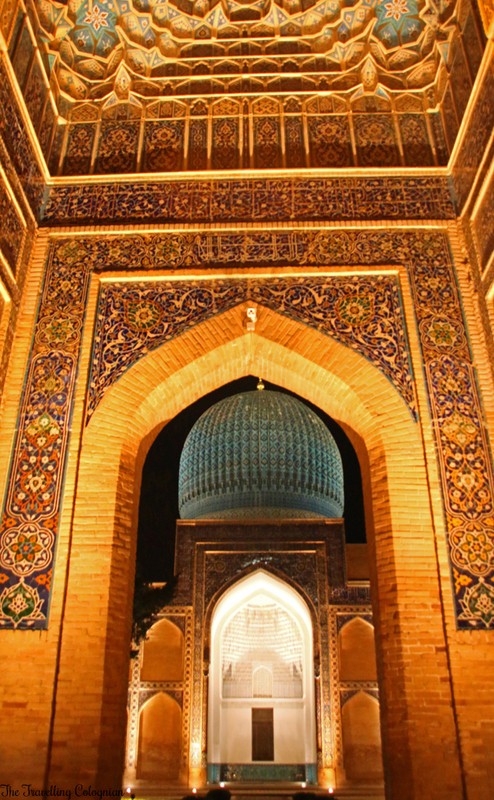 These are some of the jewels of Samarkand and they turn the city into a magical place. 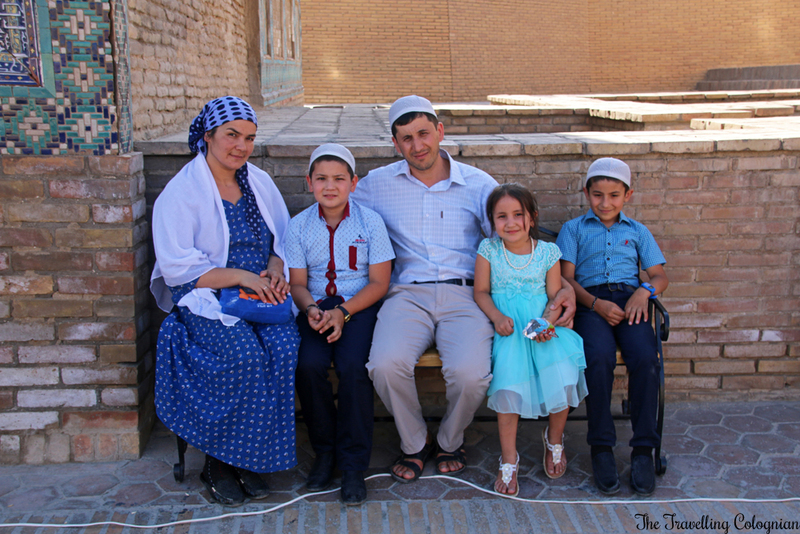 They are the reason why the historic centre of Samarkand as the “Crossroad of Cultures” became part of the UNESCO World Heritage. 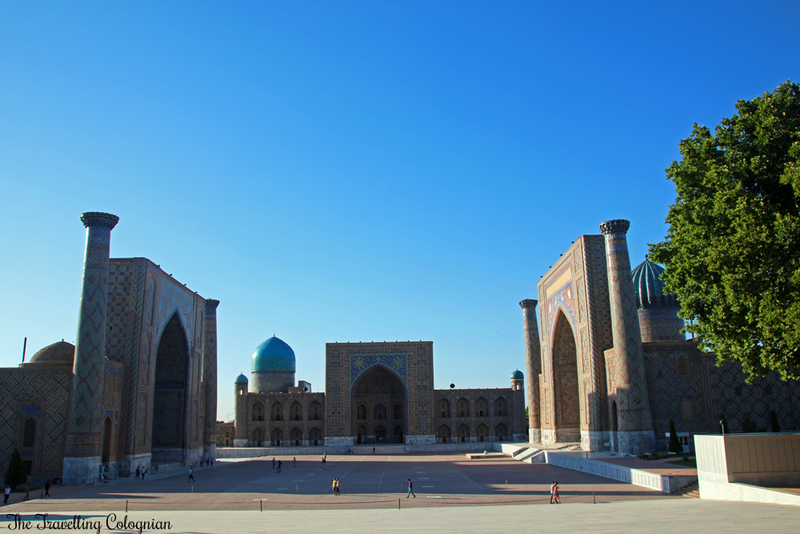 We arrived in Samarkand from Tashkent in the late afternoon. 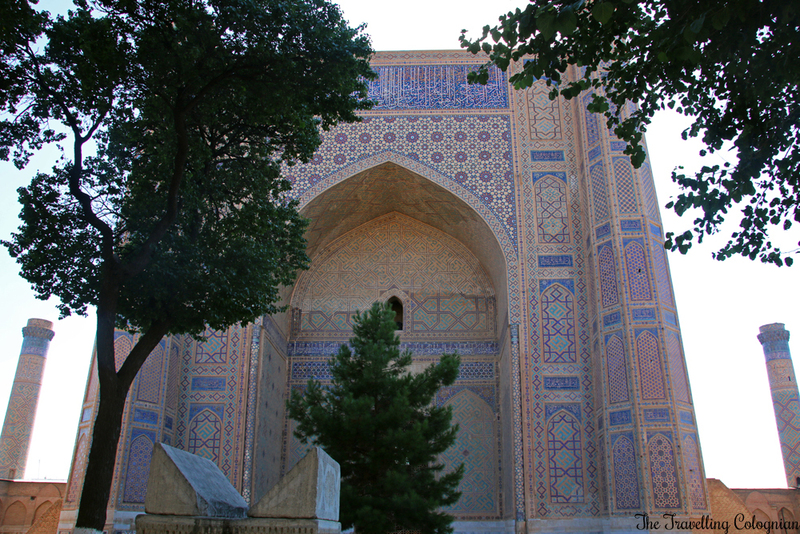 After checking into our hotel we headed straight to the Registan, the most famous monument of Samarkand. There it was, in the afternoon sun, right in front of us, and it was a lot more impressive and beautiful than I thought. On its west side was the Ulugbek Medressa, in the center the Tilla-Kari Medressa and on its east side the Sher Dor Medressa. A medressa is an Islamic koran school where the wealthy sons of the city were educated. When we approached the stunning monument we saw that we couldn’t have been luckier. 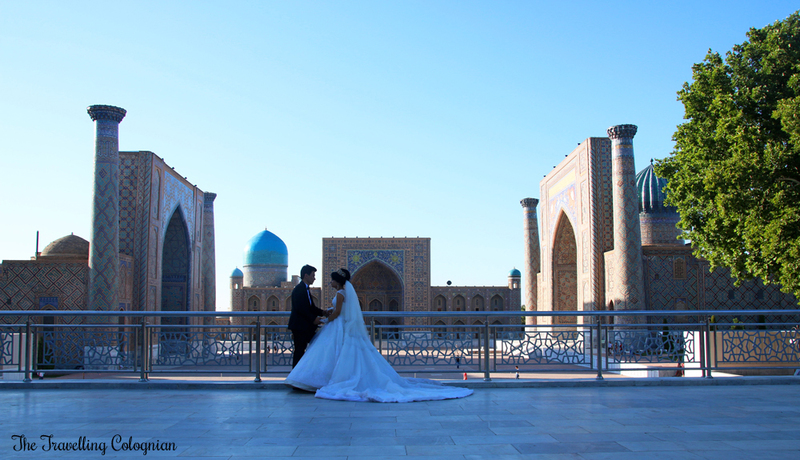 A wedding couple posed in front of the Registan. It seemed like a scene from a fairytale. I knew that the Registan was Uzbekistan’s most popular place for wedding photos but I had never expected to encounter a wedding couple in front of the Registan myself. Neither the newlyweds nor their wedding guests minded that we took photos of them, quite the contrary. They wanted to take photos with us and posed for our picutures. 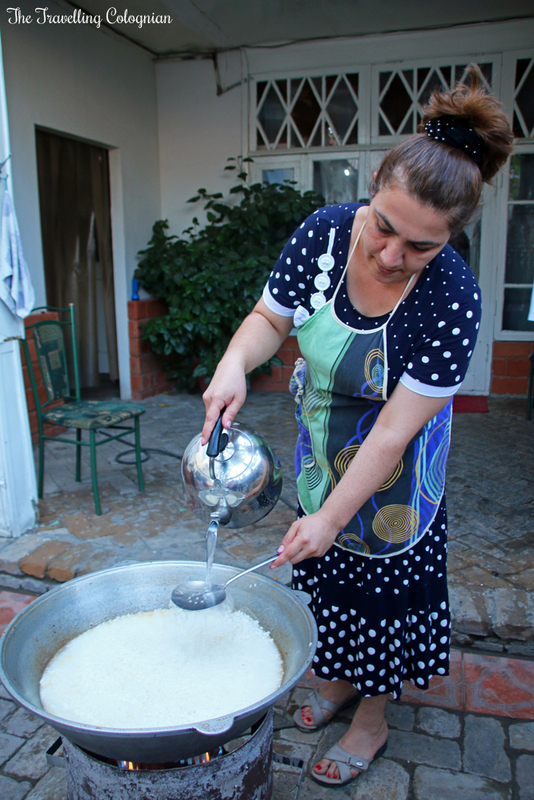 Next we were taken by private bus to a local Uzbek family’s house where we were given a Plov cooking demonstration. 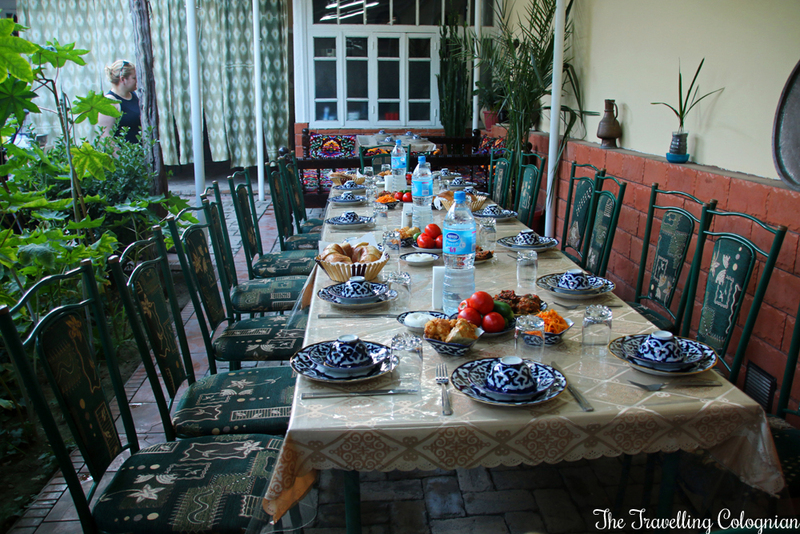 Uzbek Plov is a local dish which is prepared of rice, lamb, onions, garlic, chicken stock, carrots, chickpeas, currants, cumin, coriander, chili pepper and star anise, When we arrived at our local host’s house a long table in the courtyard was already set and a cooking zone prepared for us. 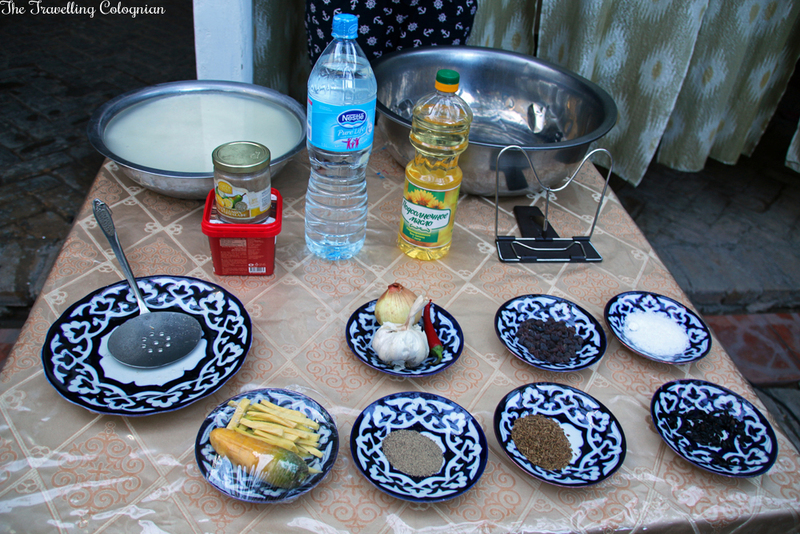 At first, Guly, our local Uzbek tour leader, gave us an introduction of the ingredients before our hosts started to prepare the Plov in front of us. While the dish was simmering our hosts served us a great variety of appetizers. 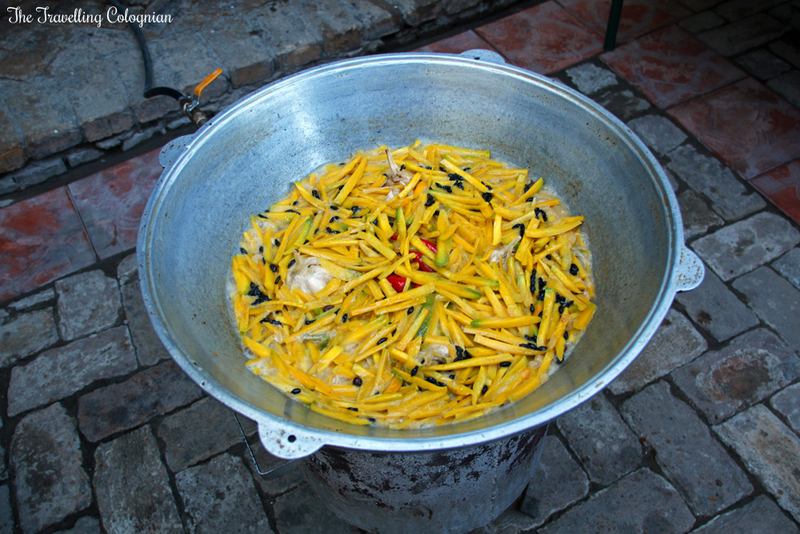 When the Plov was ready we were almost stuffed but of course we enjoyed Plov as our main dish followed by fresh fruits for dessert. 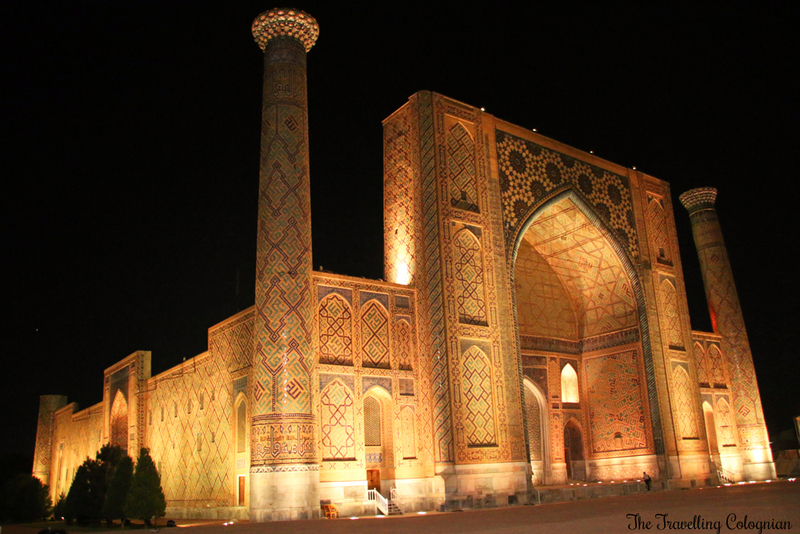 After it got dark we returned to the Registan to take night photographs of the impressive monument. Soon we aroused the interest of the locals who wanted to take pictures of and with us. 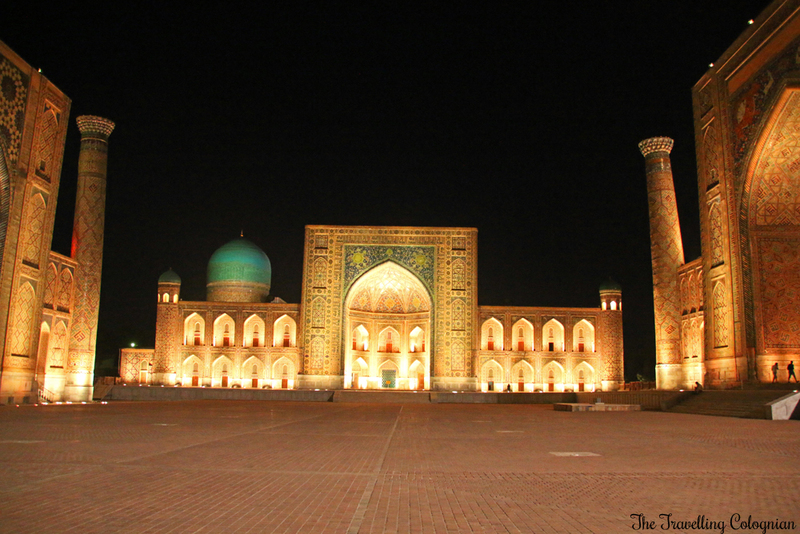 I returned to the Registan the next evening by myself to take further night photos. The following day we started our sightseeing tour with a visit of the famous Gur-E-Amir Mausoleum. 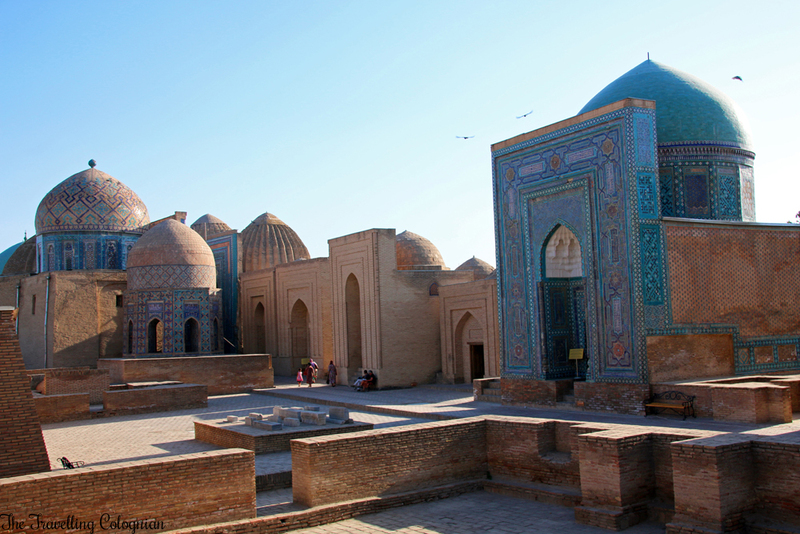 It was the resting place of Amir Timur, two of his sons, two grandsons – including his grandson Ulugh Beg – and his mentor Sheikh Mirsaijd-Bereke. 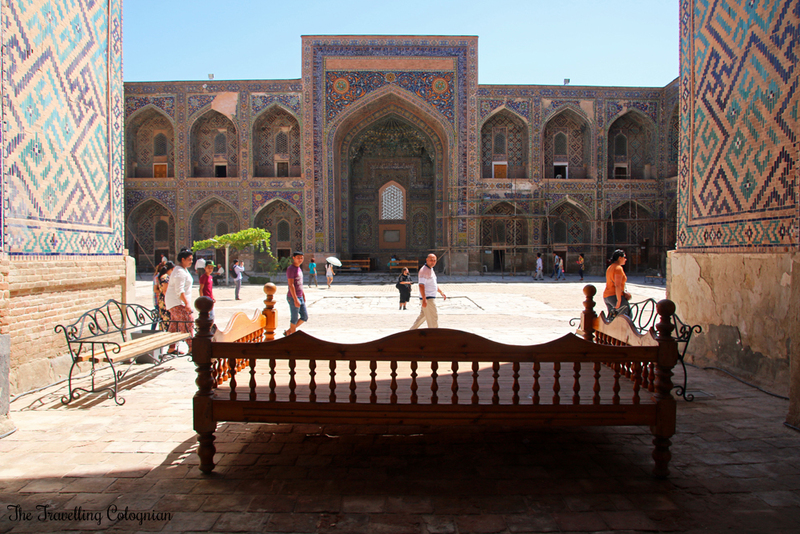 It was originally built for Timur’s grandson Muhammed Sultan who died in 1404. 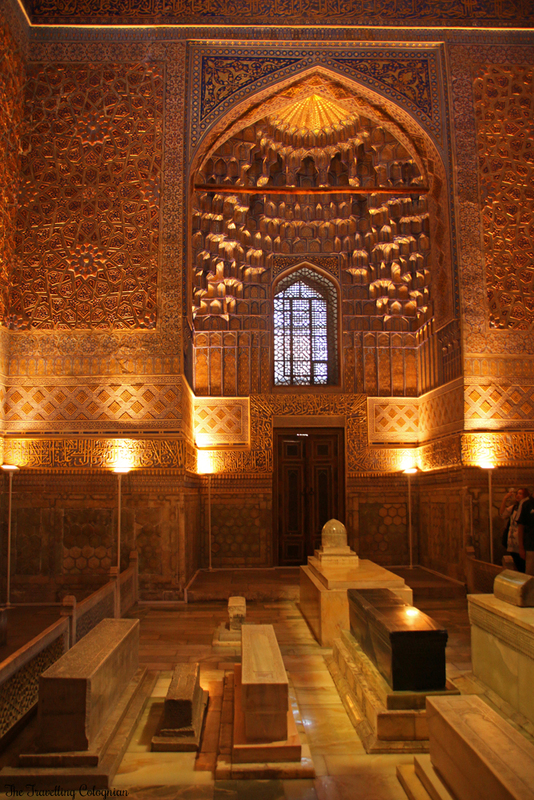 But Amir Timur who died only one year later in 1405 was buried here as well on behalf of his sons and grandsons. Already from afar we could see the two minarets and the large dome which was gleaming in the sunlight in all imaginable shades of blue and turquoise. Through the impressive entrance portal we entered the courtyard. 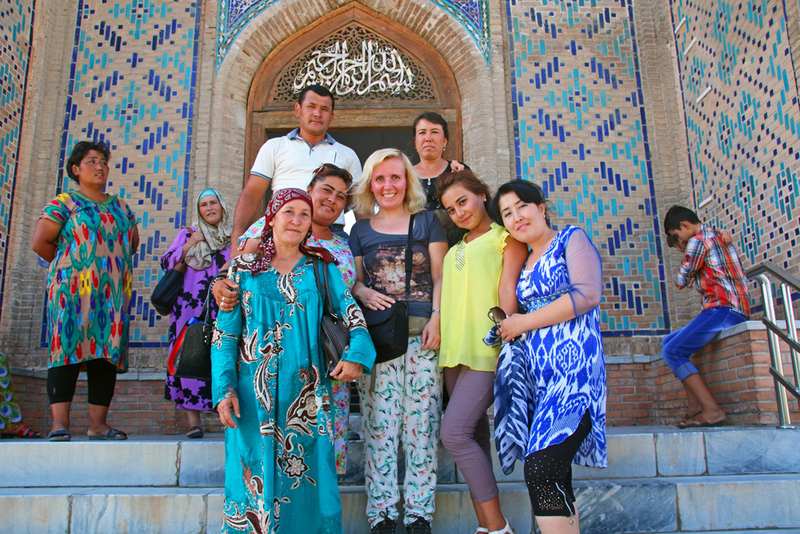 We soon mingled with the locals who were visiting the Gur-E-Amir Mausoleum as well. Then we entered the interior of the building. A splendour of gold received us. 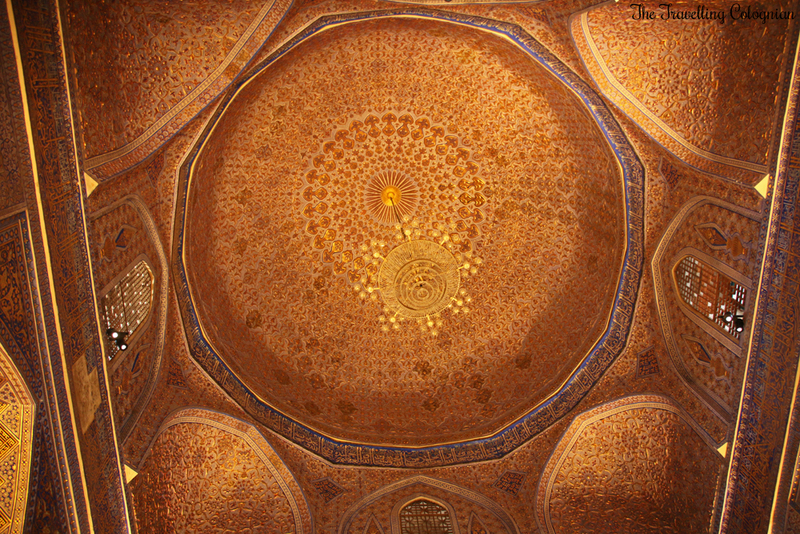 The ceiling and the walls were elaborately decorated and ornamented. On the floor several cenotaphs were located. The cenotaph of Amir Timur was black, located in the centre and thus stood out from the light cenotaphs of his relatives. The actual tombstones were located in a crypt under the main room which was accessible via an entrance from outside. We didn’t visit the crypt. 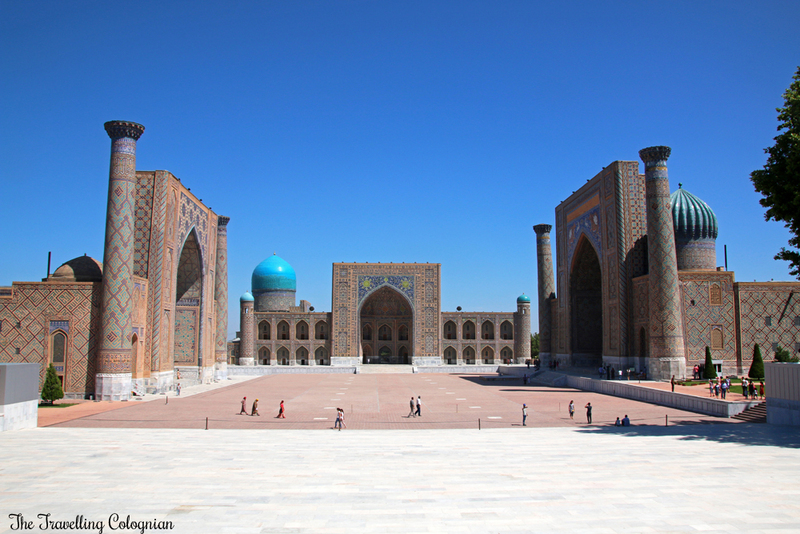 Next we headed to the Registan, probably the most famous sight of whole Uzbekistan. 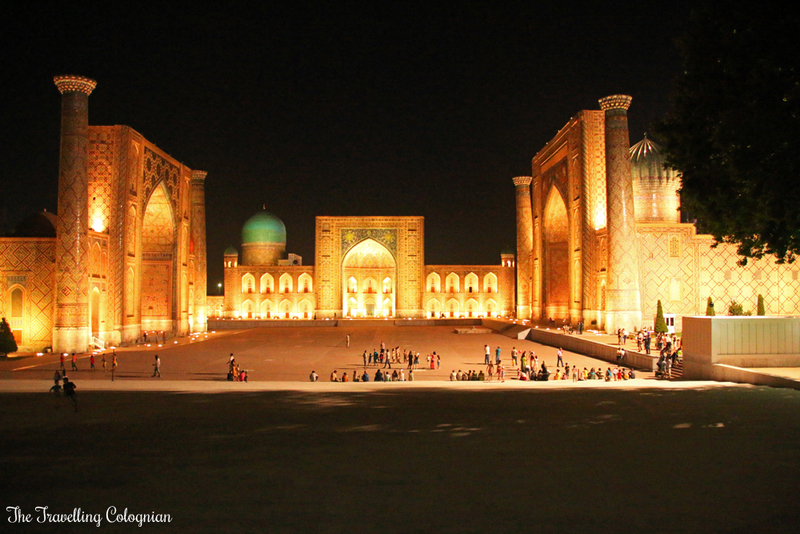 Registan means “Sandy Place” in Tajik and was once the most magnificent square of Central Asia. 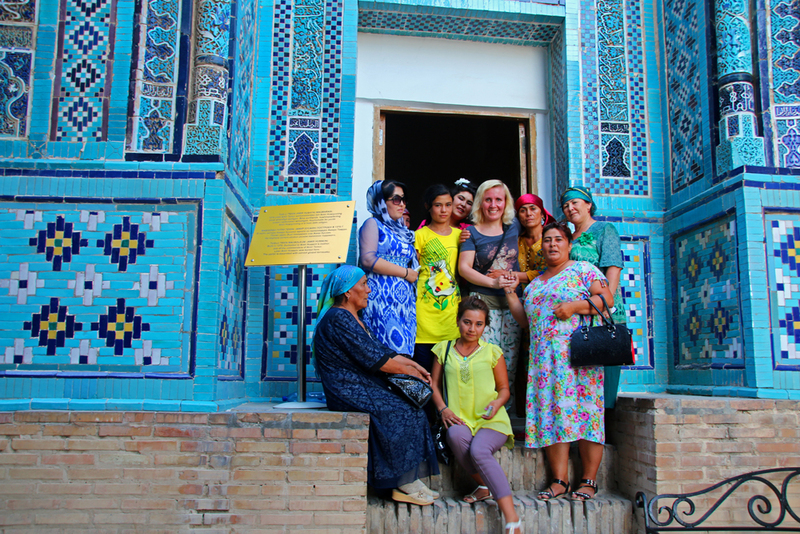 In the medieval times the Registan was also the centre of Samarkand where the main market activites took place, decrees and laws were proclaimed, military parades were held, executions enforced but it was also the place where women burned their face veils back then. The domes of the Registan shimmered in the sunlight. The atmosphere was totally different than the day before in the late afternoon. It is recommended to visit the Registan in the morning as well as in the afternoon because of the different lighting conditions. That makes it possible to take photos of all three medressas in the sunlight. We started our discovery at the Sher Dor Medressa, the right one of the three medressas of the Registan. Sher Dor means “house of tiger” because the entrance portal of the Sher Dor Medressa depicts two tigers hunting white antelopes. 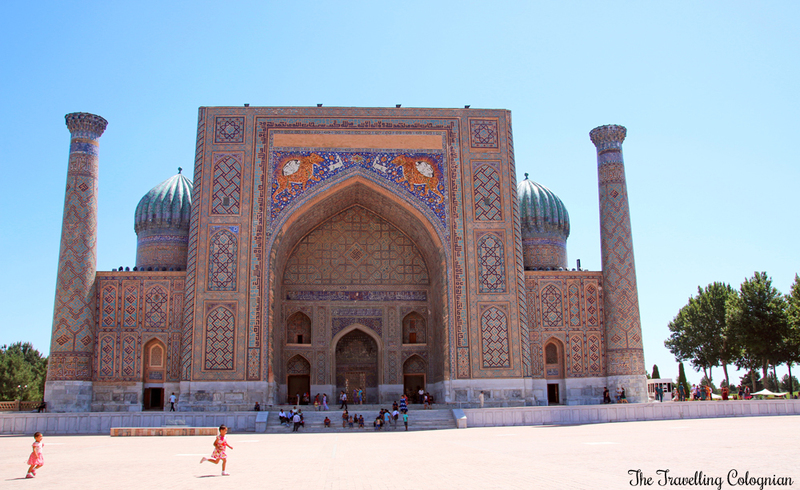 The medressa was built between 1619 and 1636 on behalf of Yalangtush Bakhodur, the ruler of Samarkand of that time. 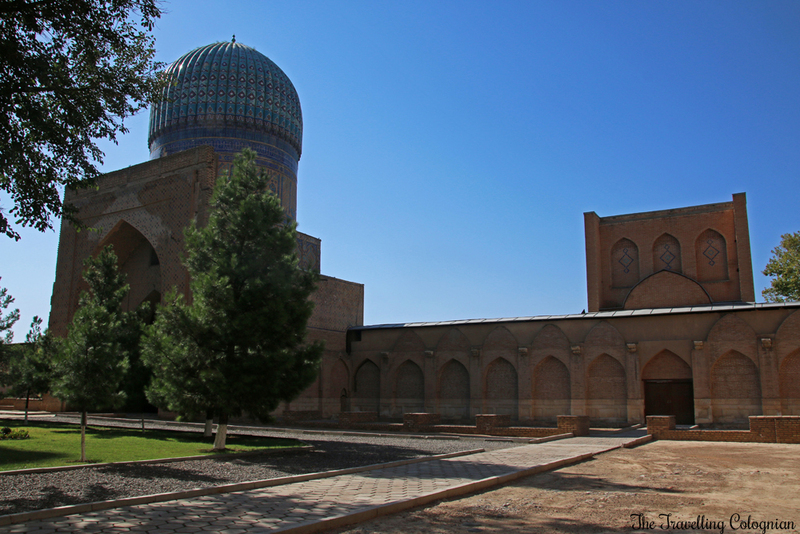 The Sher Dor Medressa is almost a copy of the older Ulugbek Medressa, is located exactly opposite and its facade length and construction are identical with the the older one. Different than the Ulugbek Medressa the Sher Dor Medressa has no winter mosque but two additional prayer rooms in the corners of the front of the medressa. The facade decoration is different as well. We discovered the Sher Dor Medressa in depth, marvelled at the domes and minarets, at the beautiful murals, decorations and majolica tiles and strolled through the lovely courtyard. There as well as partly in the former student cells vendours offered silk, handicrafts and souvenirs. Similiarly to our visit at the Gur-E-Amir Mausoleum we didn’t only meet foreigners but many locals. After visiting the Sher Dor Medressa we had enough time to explore the Registan Square individually before we explored the Ulugbek Medressa together. 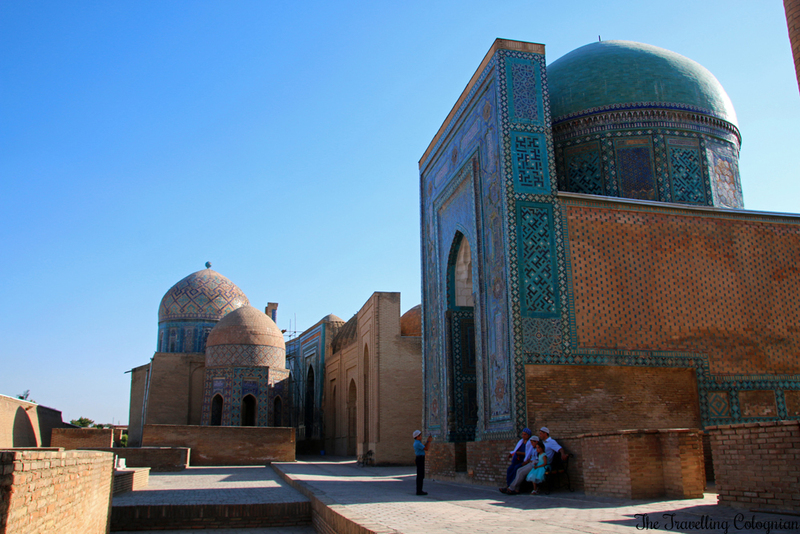 The Ulugbek Medressa is located on the left, the west side of the ensemble, and it is the oldest medressa of the Registan. 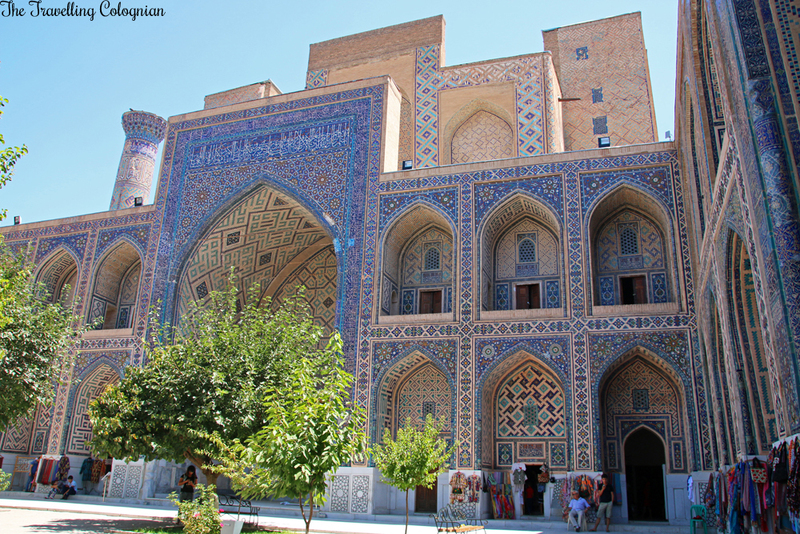 It was built between 1417 and 1420 by the astronomer, mathematician, scientist and Timurid ruler Ulugh Beg and hosts a mosque, classrooms and rooms where the students used to live. 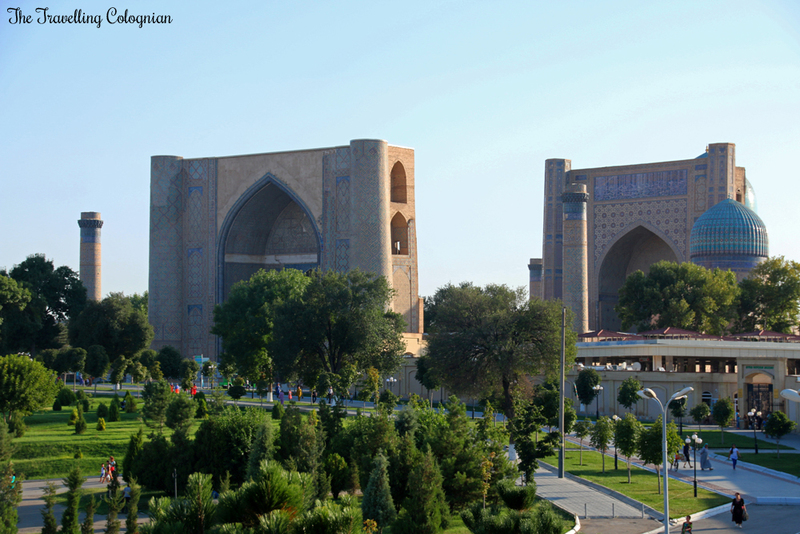 In the fifteenth century it was considered to be the best university of the Muslim world and Ulugbek used to teach here as well. 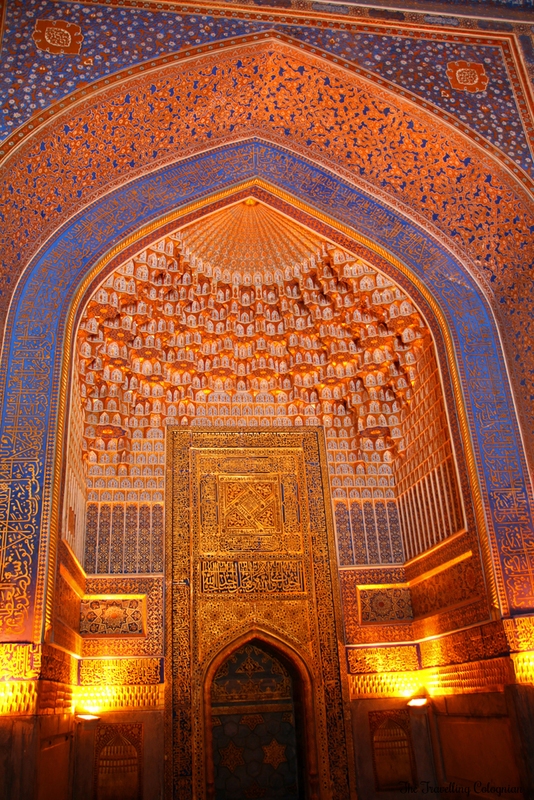 Following the interests of the astronomer Ulugh Beg the entrance portal is decorated with stars. 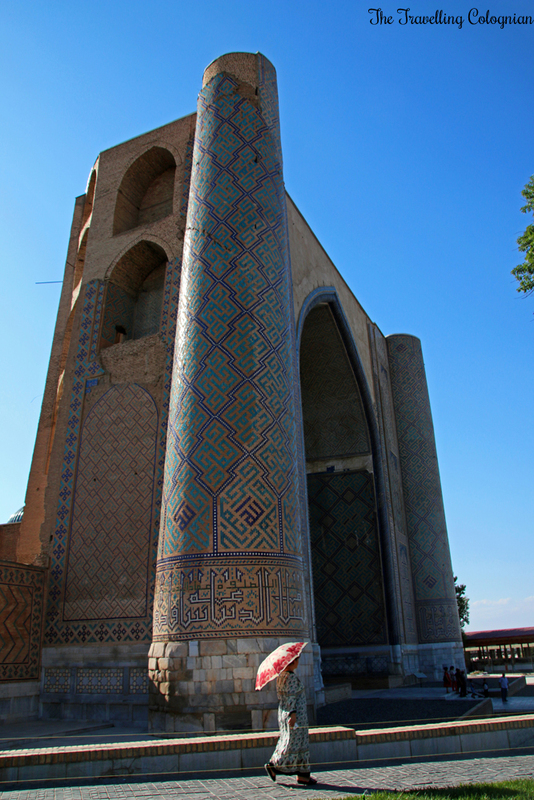 The Tilla-Kori Medressa is located in the centre of the Registan, between the Sher Dor and the Ulugbek Meressa. It was constructed between 1646 and 1660, also by Yalangtush Bakhodur, and it is the youngest of the three medressas. 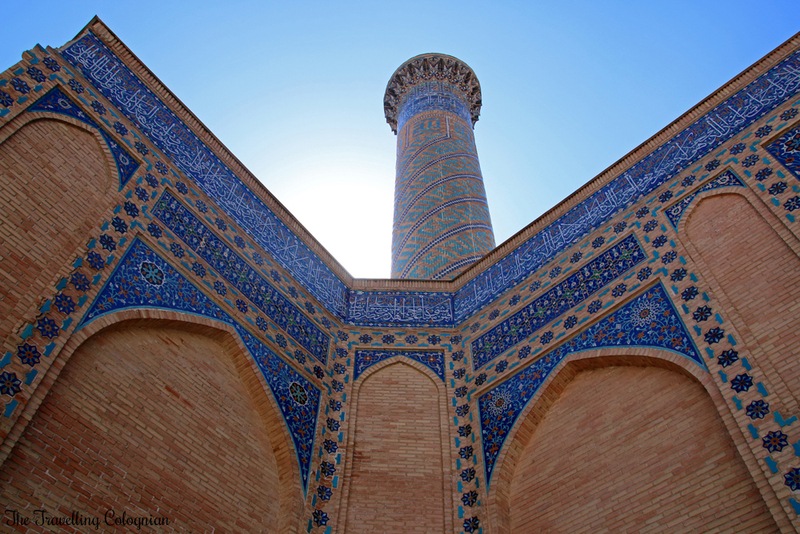 It was larger than the Ulugbek and the Sher Dor Medressa and didn’t only host a university and student cells but also a Friday Mosque. Its blue dome could be seen from outside. Tilla-Kori means “decorated with gold” and the name was given for a good reason: the main hall of the Friday Mosque was richly gilded, lushly decorated and equipped with muqarnas just like the entrance portals of the Tilla-Kori Medressa and the Gur-E-Amir Mausoleum. 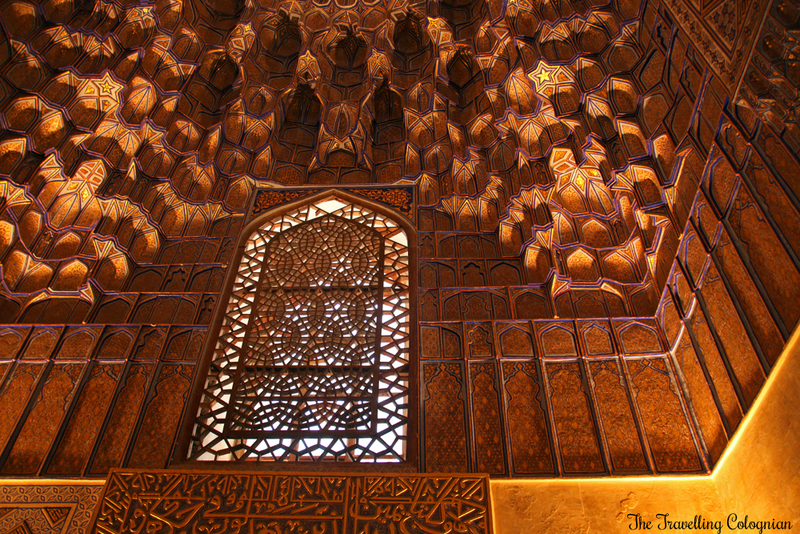 “The muqarnas, a Muslim variety of stalactite vault, is a primary characteristic of Islamic architecture. 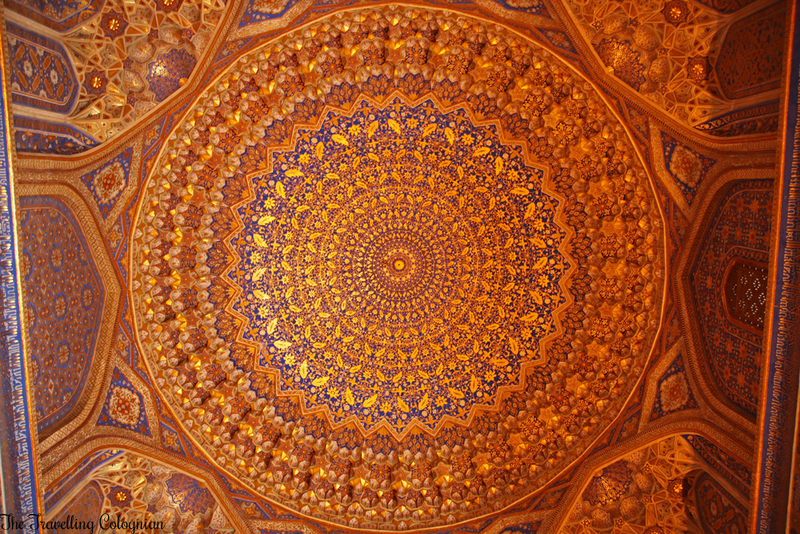 Developed during the mid-tenth century […] the muqarnas, with its honeycomb texture, became a common feature in palaces and temples” (Reference: Encyclopedia). We wandered through the Friday Mosque and couldn’t get enough of the magnificent architecture. 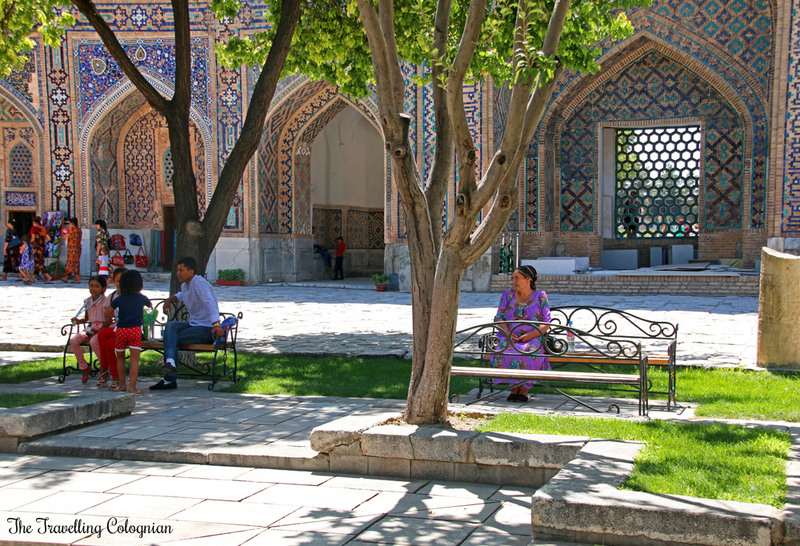 But the courtyard of the Tilla-Kori Medressa with its shade-giving trees and benches was also absolutely beautiful. 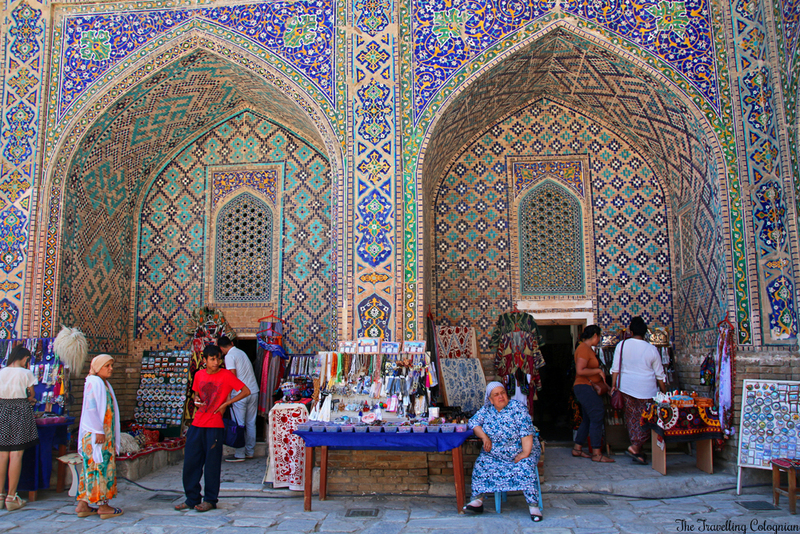 Here as well as in the former student cells Uzbek vendours offered pottery, handicrafts, silk and souvenirs. 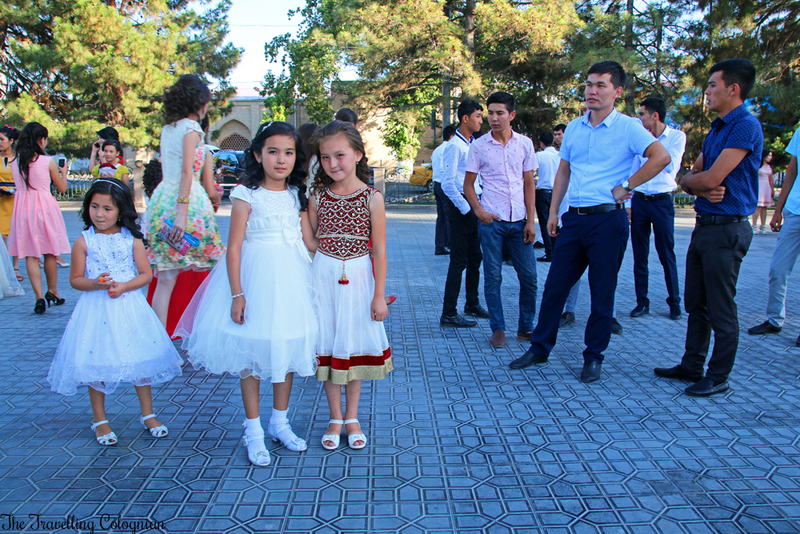 After visiting the Ulugbek and the Tilla-Kori Medressa Guly gave us a lot of time again to take photos and explore these two medressas on our own. 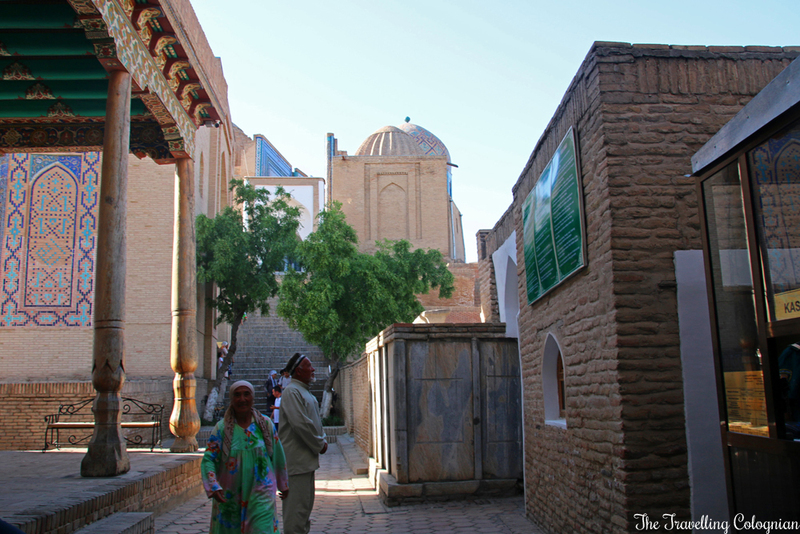 After our extensive discovery of the Registan and its medressas we walked past the Bibi Khanym Mosque to the Siyob Bazaar. This was smaller than the Chorsu Bazaar in Tashkent, but the Siyob Bazaar was also a lively and bustling market where you could buy fresh fruits and vegetables, dried fruits, spices and nuts, traditional sweets, honey, dairy products and bread. 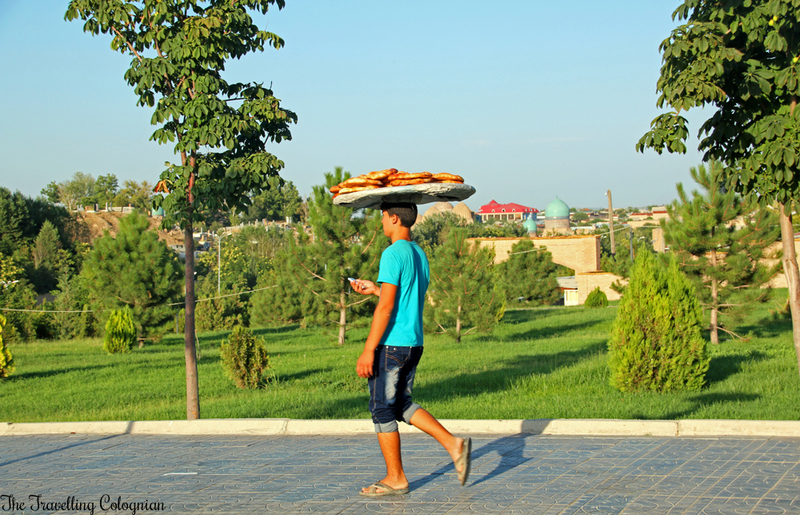 At first this looked like the typical nan bread which I knew already from the Chorsu Bazaar in Tashkent and from my trip along the Silk Road of China. 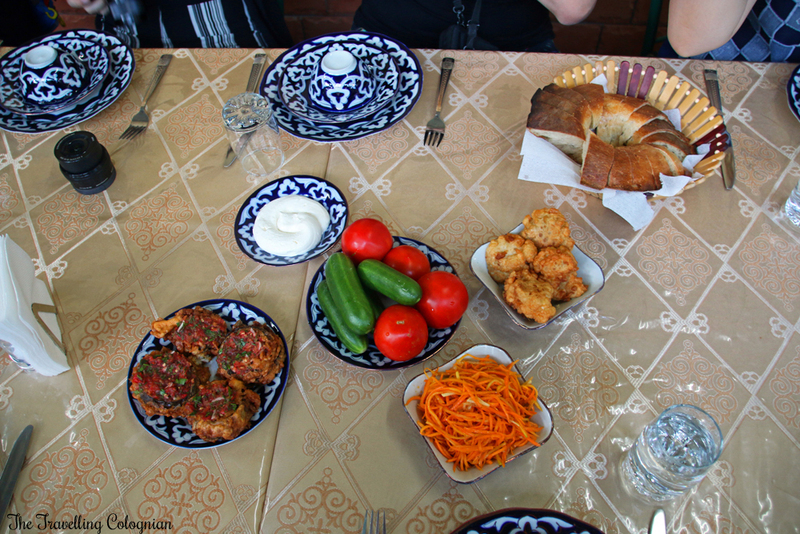 But the nan bread from Samarkand is different. For this a special flour is used and there are altogether 17 different types of bread. But we couldn’t only buy but also try the different types of bread, the vendours even insisted that we did. They negotiated, joked and laughed with their clients. One vendour walked around and sold saffron for 1 US-Dollar. The Siyob Bzaar wasn’t ‘t only a market but also a meeting place where the locals could find out the latest news. 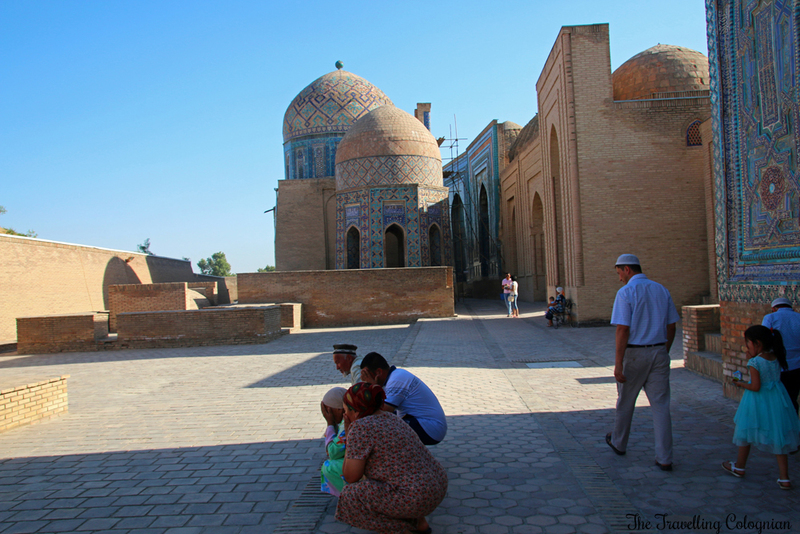 The afternoon was free so that we had time to explore more of Samarkand on our own. A few of the other females of my group and I took a taxi back to our hotel. It was mid-July, late midday and the outside temperature was between 35 and 40 degrees Celsius. The sun was burning and I felt that I needed to cool down a bit first before I was ready to see more of the city. About two hours later I returned to the Bibi Khanym Mosque. 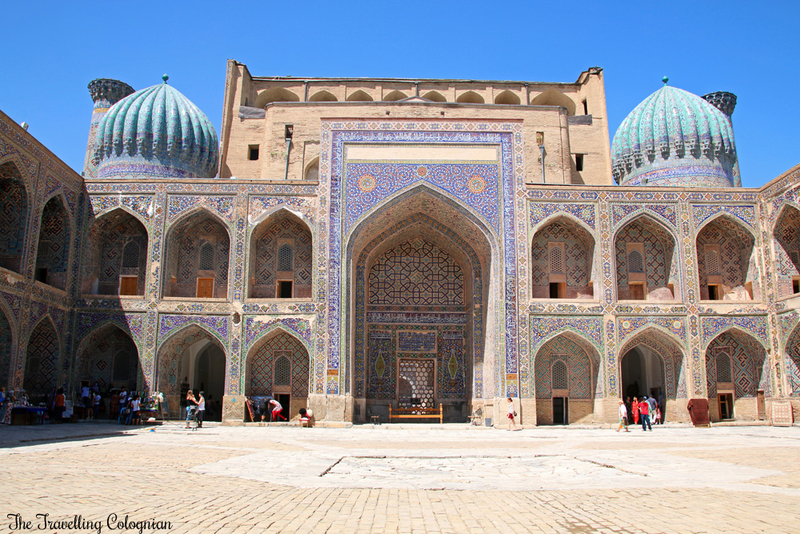 In the 15th century the complex was the greatest, most majestic and impressive of the Islamic world. Amir Timur built it for his favourite wife Bibi-Khanym. Therefore he obliged architects, artists and craftsmen from Azerbaijan, Fars in contemporary Iran, India and many other eastern countries. 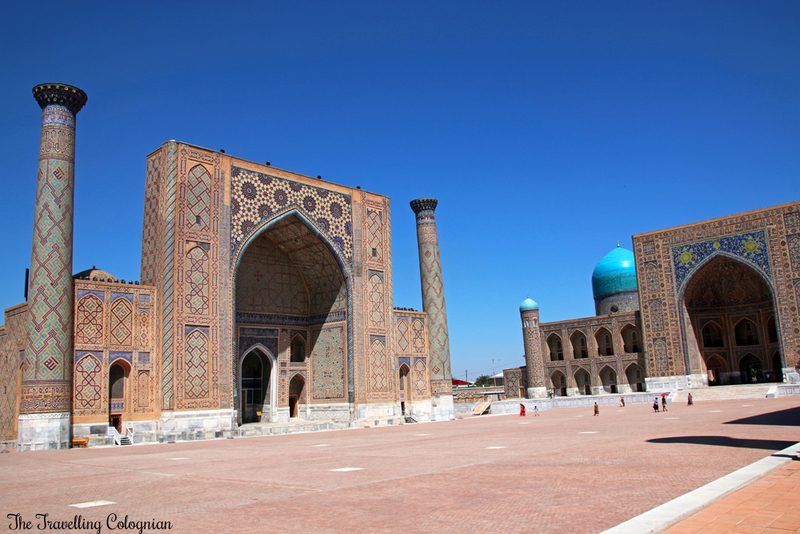 When Timur returned from a military campaign from India the complex was completed but Timur wasn’t satisfied and liquidated two of the architects. 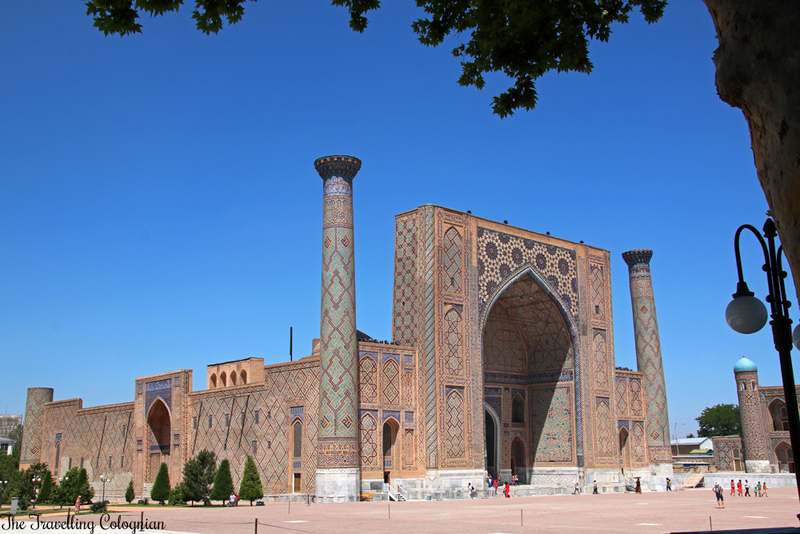 According to legend during another abscence of Timur Bibi Khanym contracted the best architects, artisans and workers and visited the construction sight on a regular basis. The main architect fell in love with Bibi Khanym and asked her to kiss him in return for the completion of the complex. 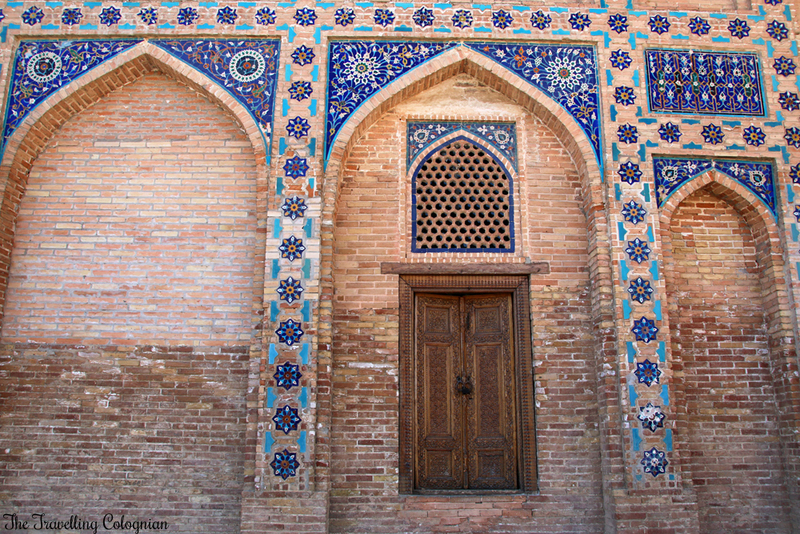 Initially Bibi Khanym refused but eventually she gave in and kissed him because she wanted the complex to be completed on the return of Amir Timur. When he found out about the kiss he wanted to have her executed by throwing her from one of the minarets. She pleaded to be allowed to wear all of her silk dresses for the execution. When she was thrown from the minaret her dresses worked like a parachute and she reached the ground unharmed. Over the centuries the Bibi Khanym Mosque deteriorated. In the middle of the 20th century it was only a picturesque ruin. For the last decades the complex is being renovated. Also when I was there the mosque was under restauration. 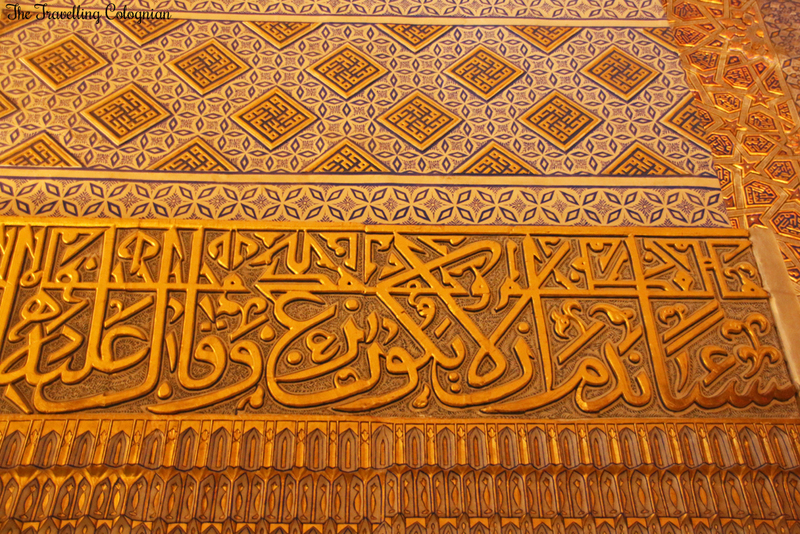 I entered the complex through the main portal which was elaborately decorated and ornamented with kufic inscriptions. Despite a few blemishes it was still very impressive. Shade-giving trees and benches in the courtyard enticed to stay for a while. 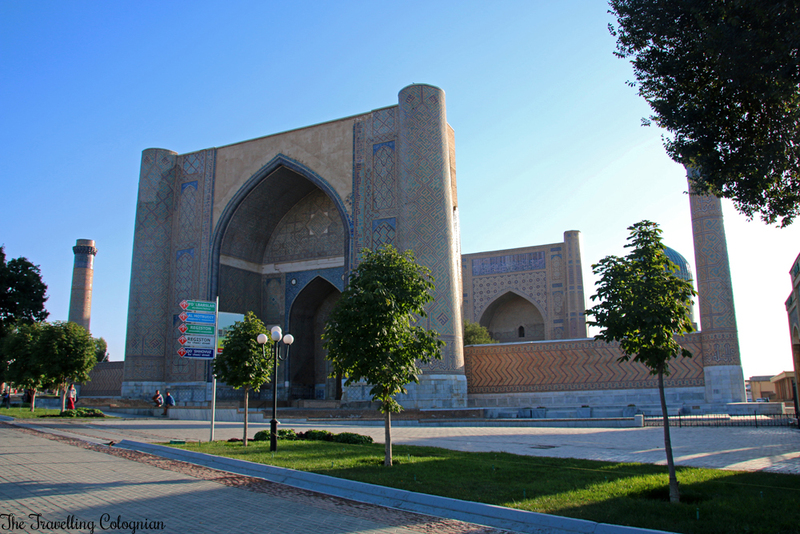 In its center was a huge Koran stand of stone, which was originally built for the Osman’s Koran Timur brought from one of his military campains and which is now kept in a special chamber in the Barak-Khan Medressa in Tashkent. Despite the restoration works it was easy to imagine how splendid the Bibi Khanym Mosque once must have been. The late midday, when I was there, wasn’t a good time for photos. I had to accept backlight, that is why I didn’t take that many photos. 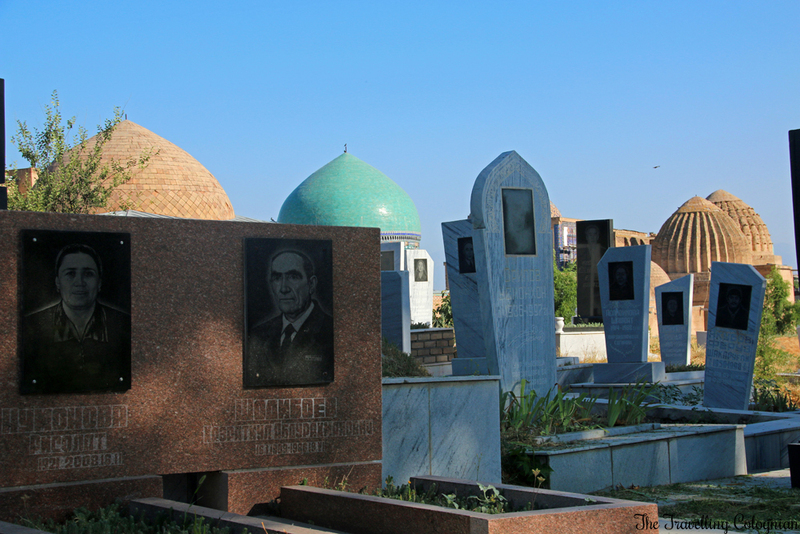 Afterwards I walked to the Bibi Khanym Mausoleum which was located directly opposite. 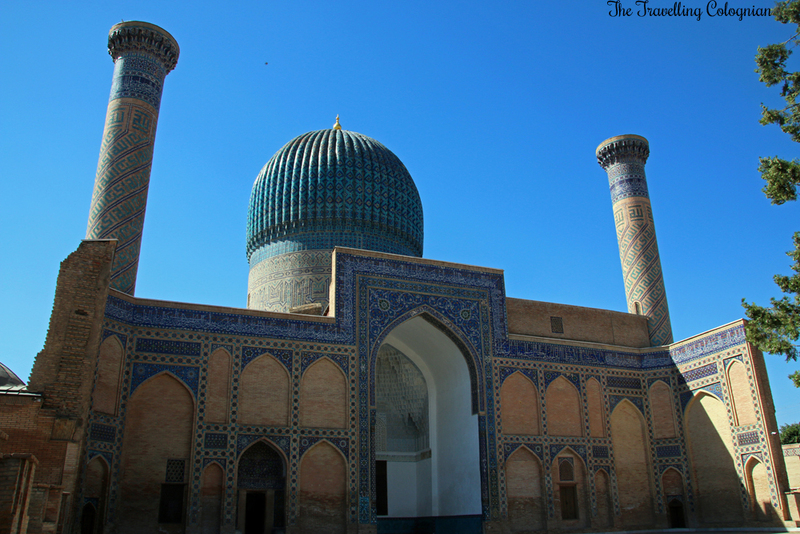 Like the Bibi Khanym Mosque it had a turquoise-glazed dome but apart from that the architecture was a lot more simple. Inside a cross-shaped interior space welcomed me. The Bibi Khanym Mausoleum hosted five tombs which are said to be those of Bibi Khanym, her mother and three of her nieces. After paying the entrance and a photo fee I was allowed to go down one floor where the tombs of Bibi Khanym and her relatives were located. Two of the tombs were located in a niche and were completely veiled in golden cloths. In a second niche three other tombs were covered with patterned carpets. 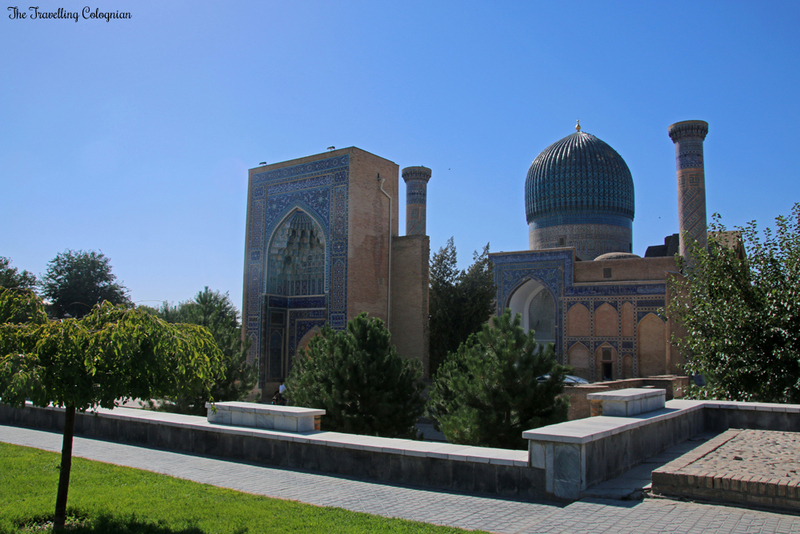 From the Bibi Khanym Mausoleum I headed to Shah-i-Zinda, the Avenue of Mausoleums. Shah-i-Zinda means “the living king”. The necropolis was a pilgrimage site long before Amir Timur. According to legend this is the place where Kusam ibn Abbas ibn Abd al Muttalib, a cousin of the Prophet Mohammed was buried. It is said that he was beheaded by unbelievers while he was praying. To avoid interrupting his prayer he grabbed his head and fled into a cave where he finished his prayer and is said to still live in secrecy. 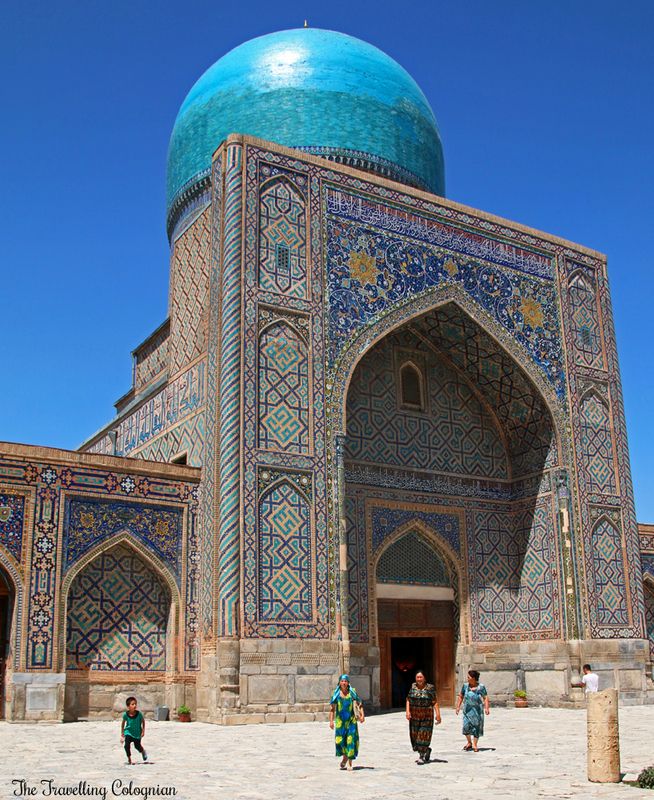 It was an honour to be buried here, that is why Timur built splendid and majestic mausoleums for his relatives and closest confidantes there. 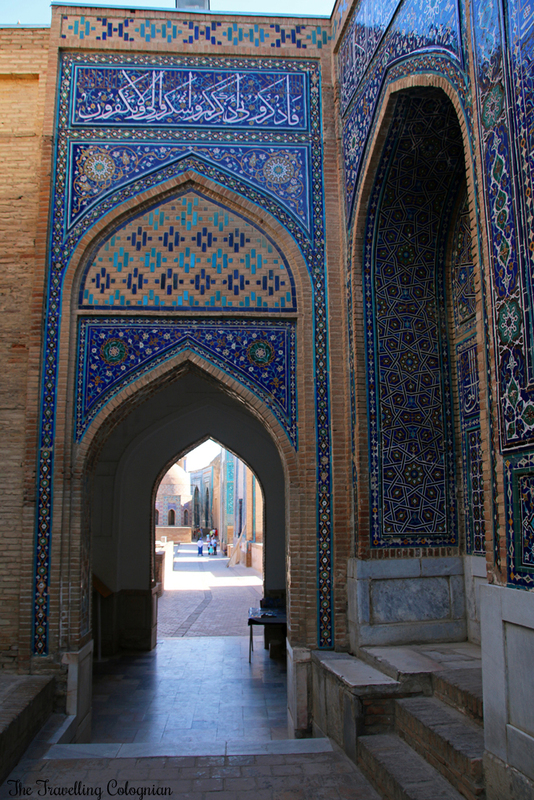 There were to entrances to Shah-i-Zinda: one from the street and another one where you first cross a cemetary. I chose the path across the cemetary. Already from there I could see azure and sandy domes. I entered the necropolis through a narrow walkway. 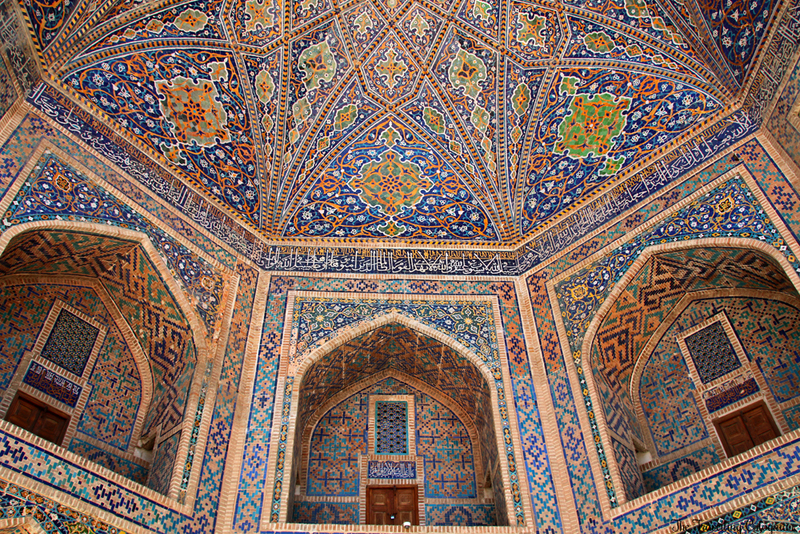 The walls were sandy, azure and blue and decorated with intricate patterns. An archway offered a view of the actual Avenue of Mausoleums. I was overwhelmed. In front of me and at the side blue, azure and sandy domes and mausoleums with intricate details rose. I walked along the mausoleums and entered a few of them. I saw praying people but I also met a lot of locals who simply seemed to spend their time there. Many people asked me for photos and put me into their middle but they also posed for my photos. I was surrounded and indmidst the locals. I literally spent hours at the necropolis. 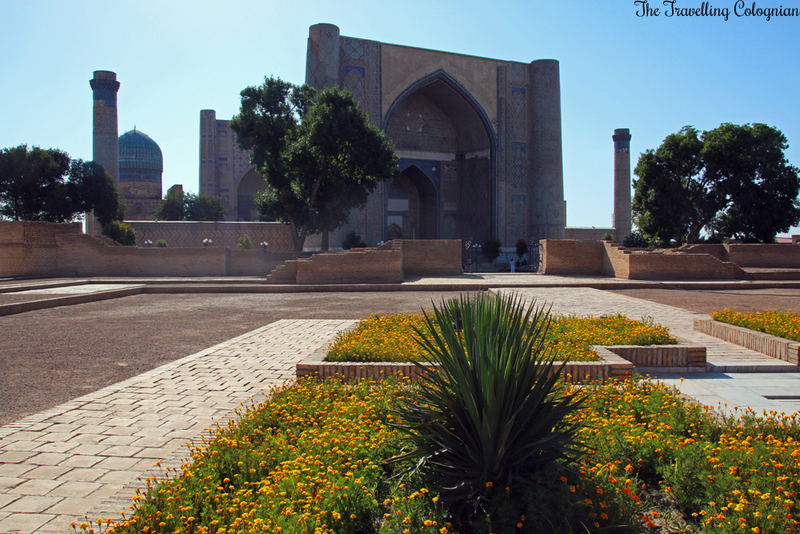 Besides the Registan Shah-i-Zinda was my favourite sight in Samarkand. 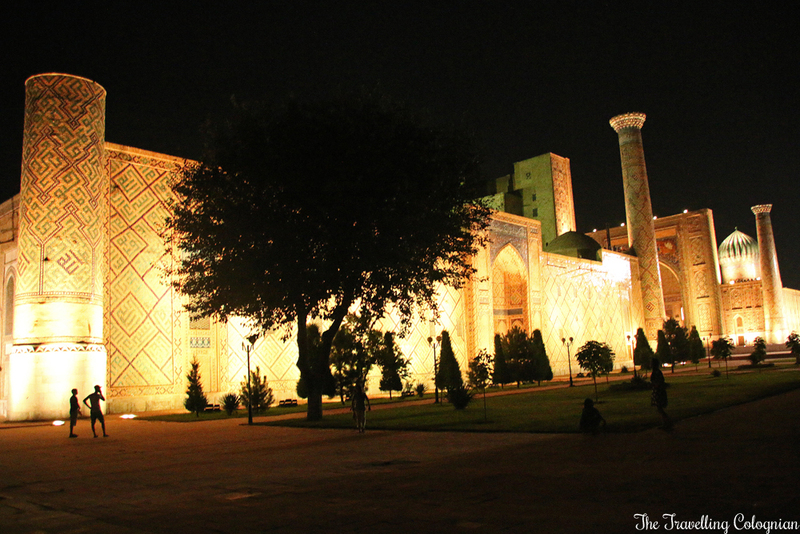 At night I took a taxi to the Gur-E-Amir Mausoleum because I wanted to take night photographs of the illuminated monument. From there I walked to the Registan to take further night photos. I spent quite some time there and mingled with the locals. On my way back to the hotel I got lost. We had walked back from the Registan with a few people of my group the night before but this time I somehow made a wrong turn. 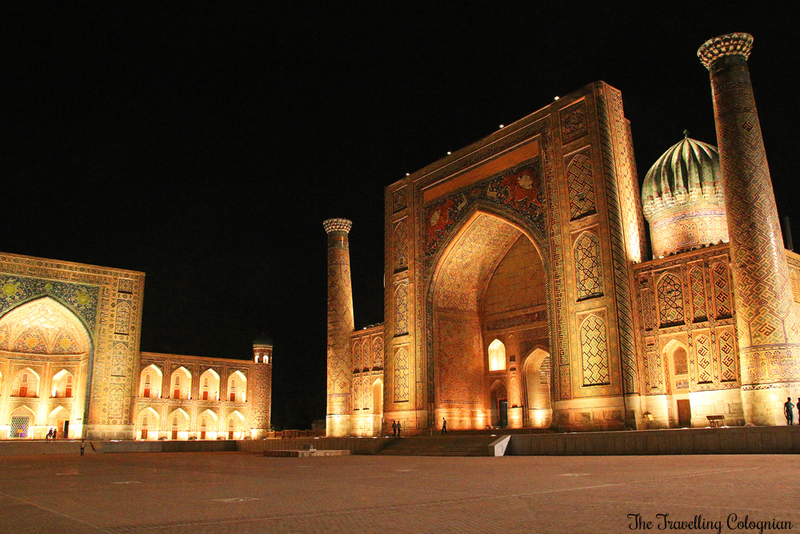 However, I ended up in an unlit empty street still being able to see the illuminated domes and minarets of the Registan. Then, when walking further, I heard voices which came out of one of the houses. I knocked at the door and showed the man who opened, my hotel business card. He didn’t speak a word of English but he gesticulated that I should wait. Instead of just giving me directions he guided me all the way back to my hotel and ensured that I got there safely. 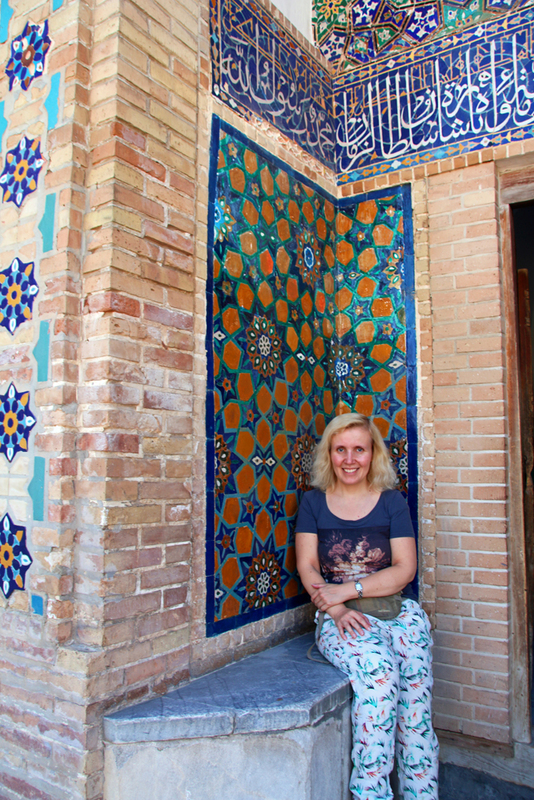 Besides the beauty of the majestic and splendid monuments – the jewels of Samarkand – it were the warmth, the open-mindness and the hospitality which really turned my stay in Samarkand into something special. 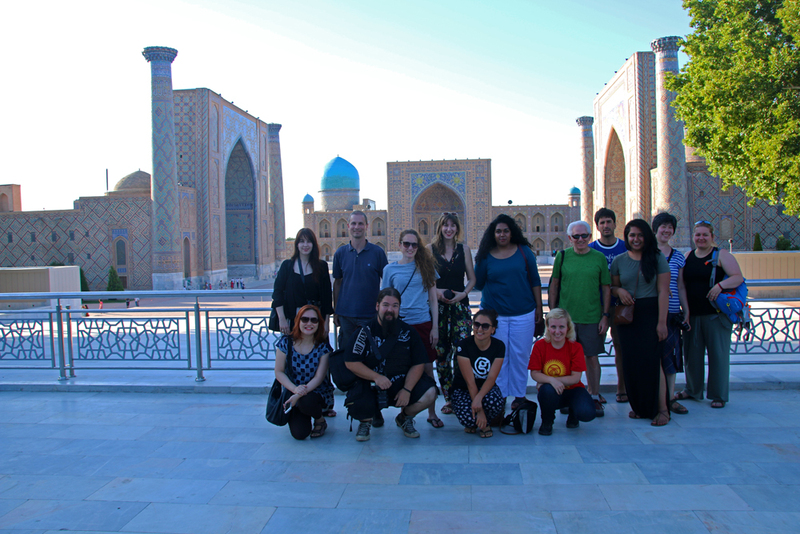 I travelled through Uzbekistan with G Adventures* on their Best of Uzbekistan* trip. We stayed two nights in the Hotel Malika Diyora. * It was centrally located and in walking distance to the Registan. It was a nice hotel with lovely staff, a good breakfast buffet and a small swimming pool. But don’t expect too much from the latter. When I was there in mid-July the water was not very deep but pretty warm so it was more like sitting in a bath tub. 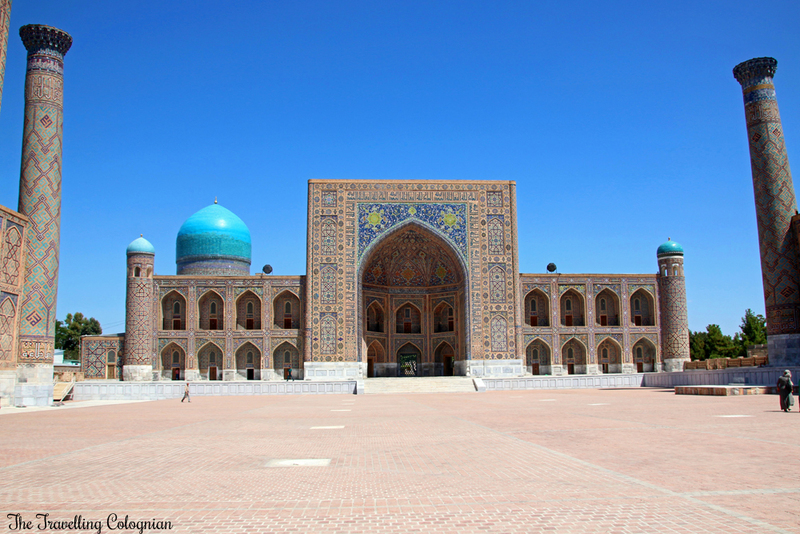 Make sure you get to see the Registan twice, in the morning and in the late afternoon. In this way you get the best light for photos. Try to avoid visiting the Bibi Khanym Mosque in the afternoon. That was the time when I was there and I struggled with strong backlight which is not good for photos. If you plan to visit the Registan twice the same day, tell this to the staff at the admission control when you visit for the first time. Then this will be noted on your ticket and you only have to pay the entrance fee once. 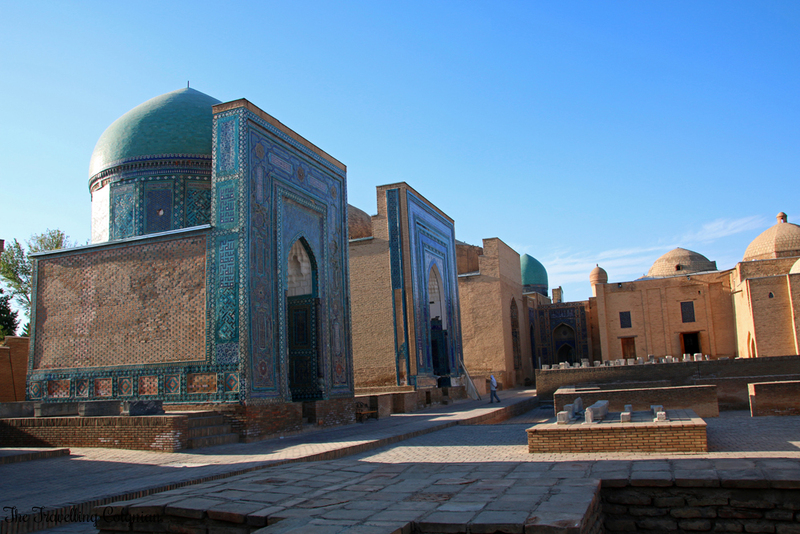 Maybe this also goes for other sights in Samarkand and for Uzbekistan in general but I don’t know this for sure. Just give it a try. Many of the sights charge a photography fee when you bring a camera with you. That doesn’t only go for Samarkand but for whole Uzbekistan. Mostly it costs between 3,000 and 6,000 Uzbek Som (0.90 and 1.82 US-Dollars/77 Cent and 1.77 Euro) (as of July 2016). In my opinion the photos are definitely worth the extra money. *I am an affiliate of Booking.com and G Adventures. That means that I would earn a small commission if you book a hotel or a tour through the given links, of course at no extra cost for you. All affiliate links are marked with a *. These help me to cover a part of the costs of running this site – so thanks a million in advance. When you are a returning traveller of G Adventures you even get your five percent discount in case you filled out the evaluation form within a month after your previous tour. After booking just send G Adventures an email or give them a call and claim your discount if it doesn’t appear on your bill automatically. Being an affiliate doesn’t affect my opinion in any way. I only recommend companies and products which I personally use and love. 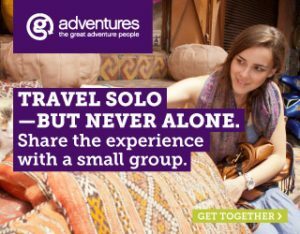 I used G Adventures and Booking.com many times before becoming an affiliate of them. 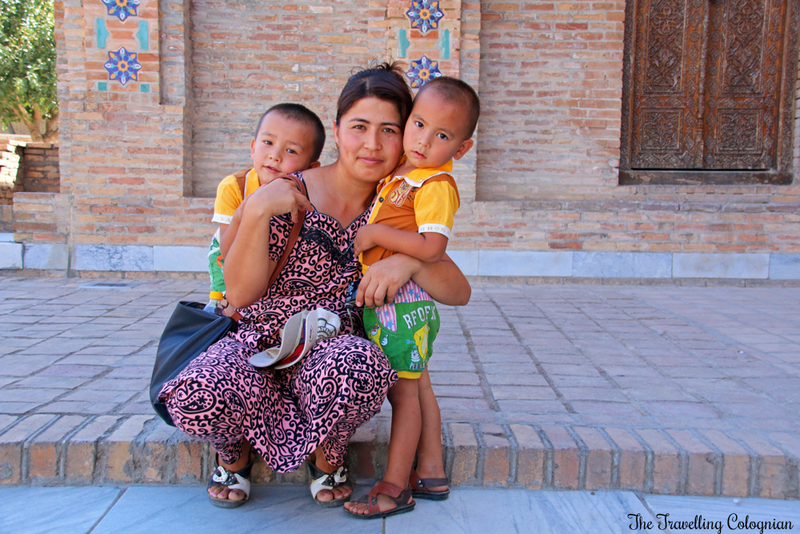 I’ve been enjoying your posts on Uzbekistan, Vanessa. The Registan really looks magnificent, day and night, in the morning and in the afternoon. 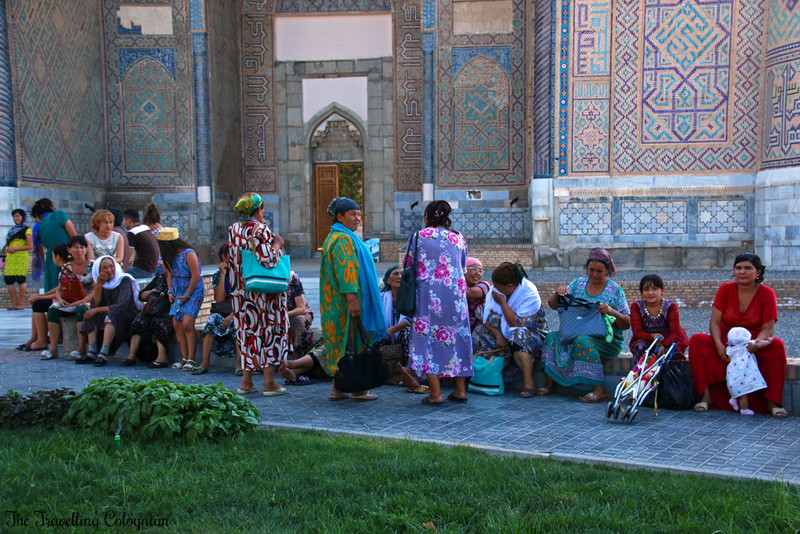 I wonder about one thing, since you went in July – which is usually peak season – were there a lot of other tourists when you were in Samarkand (and in Uzbekistan in general)? It’s a long way to go for me to get there, but I know it will worth the journey. ‘Love the photography Vanessa, and the friendly people. Very nice indeed.